Staten Island, NY - An Orthodox Jewish man is being hailed as a hero today after preventing a man from taking a fatal leap off the side of the Verrazzano Bridge. Tuli Abraham, son of community activist Isaac Abraham, was driving from his Toms River home to Brooklyn on the lower level of the bridge at approximately 2:45 PM when the car in front of him, a dark colored Mercedes Benz with New York license plates, stopped in the right lane of the bridge. When Abraham saw the driver of the Mercedes put on his hazard lights, exit his vehicle and head towards the side of the span, he asked the unidentified senior citizen where he was going. “He told my son he was going to jump and my son said ‘hell no, you are not going to jump!’” Isaac Abraham told VIN News. The younger Abraham stopped his own car and headed for the jumper who had climbed over the railing and had raised his hands in the air as he prepared to jump. Reaching in the space between the bridge’s metal railing and the concrete barrier, Abraham grabbed the man’s belt with one hand and his jacket with the other. Hoping to free himself, the jumper struggled with Abraham, whose wife called 911 for assistance. Several cars passed by before Abraham managed to catch the attention of a state trooper passing by. Jumping out of his vehicle to help, the state trooper grabbed the man’s legs to immobilize him and prevent him from potentially pulling his rescuers with him into the water, over 200 feet below. 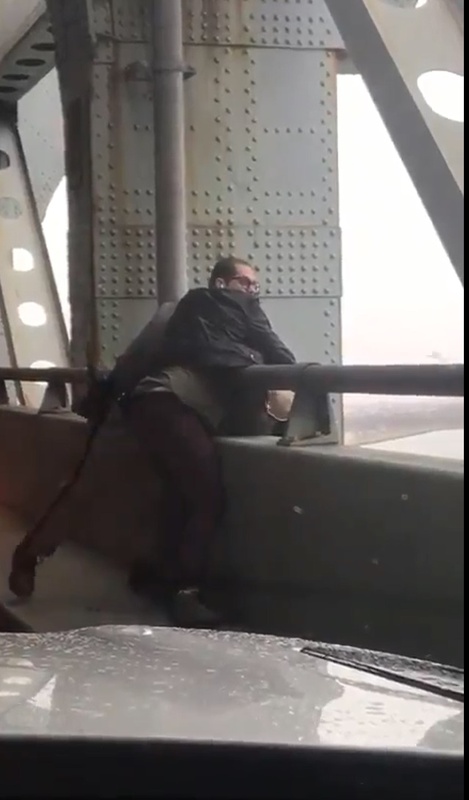 As Abraham’s wife began filming the incident on her cell phone, several NYPD officers and good Samaritans raced over to help, the seven men pulling the unidentified jumper to safety and laying him down on the roadway of the bridge. Abraham said that his son told the state trooper that in all of his life, he had never been so happy to see state troopers on a bridge. The New York State Police identified its officer as Trooper Joshua Kaye, SP Staten Island. He was taken to Staten Island University Hospital to be treated for pain in his ribs and back. The unidentified jumper was taken to NYU-Langone Hospital in Brooklyn to be evaluated. The NYPD Special Operations Bureau took to Twitter, commending those involved in the incident. Leaving off religion. Is this not a FREE country? what right and what kind of hero are you to stop a guy from taking his life. It is his choice to live or not to live. He chooses to go, yes a tragedy, but let him. Wonderful news. A wonderful act of heroism. You're a complete nutcase. The man obviously has a psychological issue and needs help. I'm pretty sure you wouldn't be so cavalier about his life if it was your relative. Have a heart. I can only imagine the world being run by ideologues and intellects... You might be 100% right, but I'm proud to be of the people who jump to rescue without resolving first your conundrum. If that person really wants to go suicide there's an infinite other ways how to take his life without involving bystanders. The United States of America is a free country, but still subject to the Rules of The Creator. The life of a human being is completely in the Hands of G-d. Also, this poor fellow parked his car in a traffic lane on the Verrazano Bridge. That's against the law in the free country you live in, isn't it?? Don't go away mad, Anon...just go away. To anonymous: what you say sounds right but in essence if you know anything about people that commit suicide, you would say differently. A person that is in a position to take his own life, at that moment is NOT able to rationalize, make mentally sound decisions, or see past his current situation. He doesnt see that with help, tomorrow can be a "sunny" day or that his problem can dissipate. At that point of no return , he is not able to call the shots. Chas vshalom it should never be anyone near and dear to you, but the mental health status of such an individual isnt stable to decide life and death decisions . How beautiful that you are lucky enough to remain unaware. Suicide is generally viewed as a psychological disorder, and people need to be protected from themselves. Suicidality is a serious condition and not a rational choice for a free thinking person. Kind of ironic calling a Jew a Good Samaritan! I'm sure PaulinSaudi gets it. This is a Jewish news site you must be a troll. Firstly your lack of compassion secondly given what we know about mental health most people do not make a rational choice to end their life and therefore it makes sense to stop someone even by secular standards. Tell you what, we won't stop you from jumping off a bridge. Twisted liberal mind. You have it all wrong. Many people that attempt suicide in public places hope that somebody might stop and help. There are way simpler quicker suicide methods than shlepping to the Verrazzano on a Sunday afternoon when traffic is at its peak. Some people want to die and at the same time they want to be rescued.